New Market Kolkata India slaughterhouse | sorting of chickens for weight and size. New Market Kolkata India slaughterhouse | laborers sort chickens for weight and size for the local market. 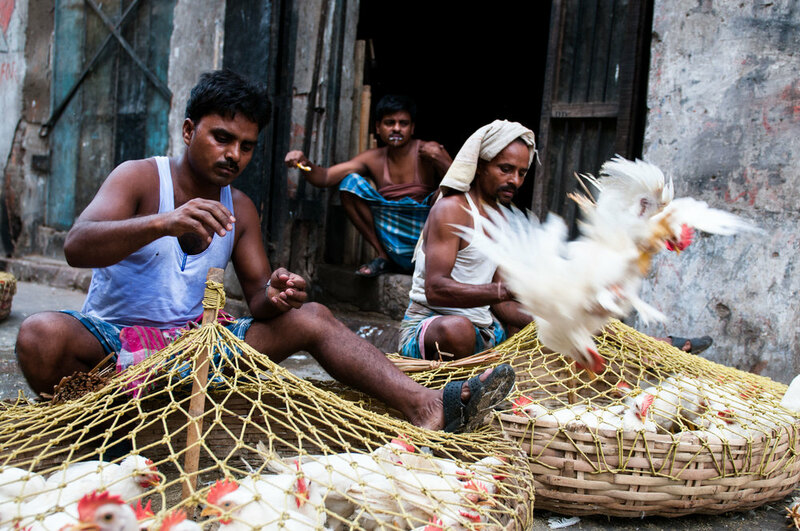 New Market Kolkata India slaughterhouse | laborers hang chickens for bicycle transport. A day laborer posing in a side alley near the new Market. He's been around since the early morning hours. New Market Kolkata India slaughterhouse | the cyclist is prepared for chicken delivery for customer throughout the city. 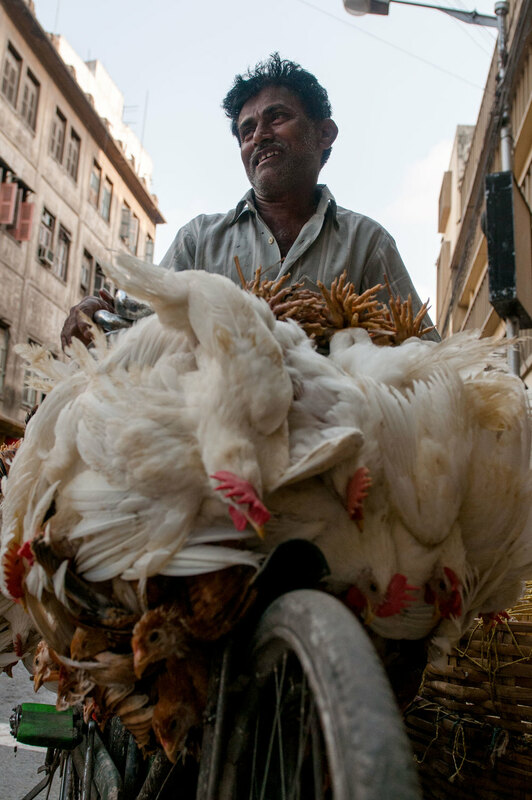 New Market Kolkata India slaughterhouse | early morning chicken delivery cyclist. small chicken slaughterhouse near the new market | Day labourers tending various task. New Market Kolkata India slaughterhouse | small chicken slaughterhouse near the new market. 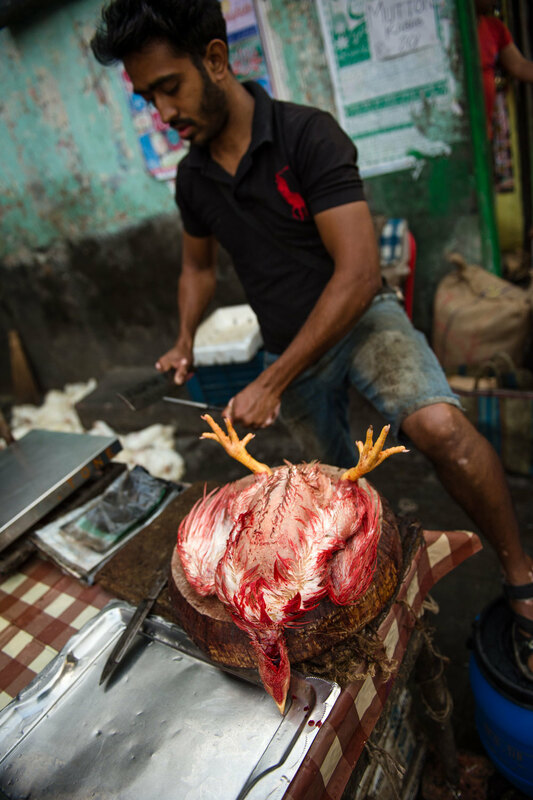 Day laborers plucking chicken heads and wings to sell to restaurants. New Market Kolkata India slaughterhouse | in front of the small slaughterhouse, the shop owner butchers a chicken for a customer. 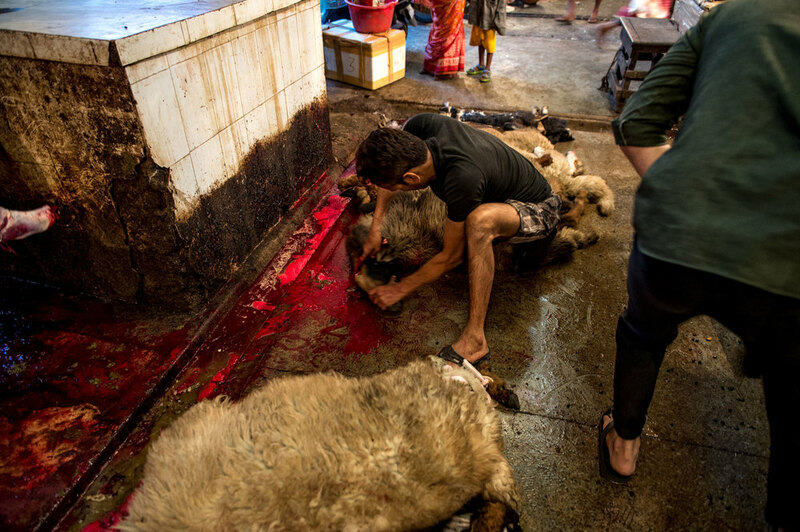 New Market Kolkata India slaughterhouse | A butcher who cuts the throat of a goat. The Commandment of Islamic slaughter is considered extremely gentle, with a precise and swift cut of the oesophagus and tracheathis severs the two main arteries, stops blood flow to the brain and blocks the pain sensors. New Market Kolkata India slaughterhouse | A severed Goat Head will be sold immediately to a dealer in the New Market A butcher who cuts the throat of a goat. The Commandment of Islamic slaughter is considered extremely gentle, with a precise and swift cut of the oesophagus and trachea this severs the two main arteries, stops blood flow to the brain and blocks the pain sensors. New Market Kolkata India slaughterhouse | Butchers undergo a rigorous and precise training which covers both handcraft and ritual/spiritual practices. 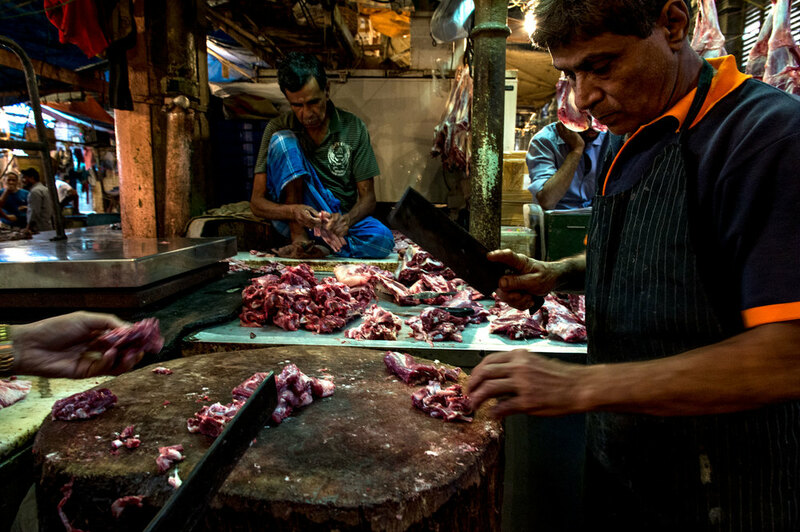 New Market Kolkata India slaughterhouse | Restaurant owner and chef, separating meat from the bone. New Market Kolkata India slaughterhouse | a child worker posing in the meat hall of New Market. New Market Kolkata India slaughterhouse | since generations from father to son. New Market Kolkata India slaughterhouse.